How to conquer the fear of falling is an important question that confronts all climbers eventually. 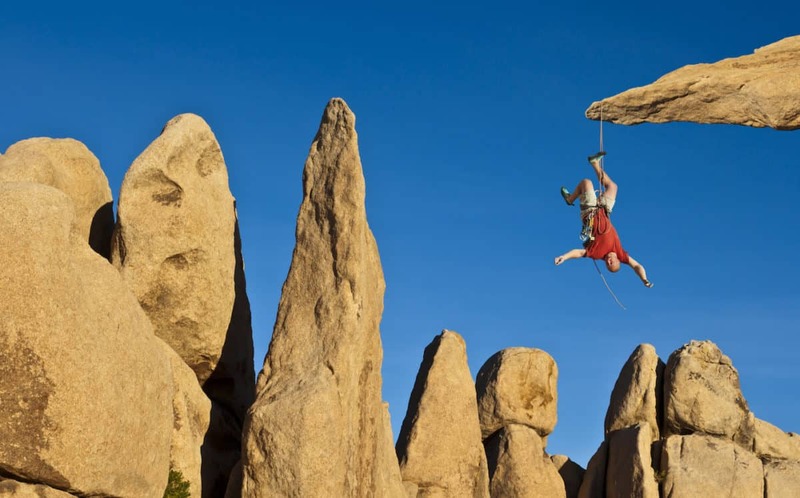 Being scared of heights is natural, but in the sport of climbing, fear can be paralyzing. It can freeze you, impair your vision and your problem-solving faculties, and release a tide of anxiety strong enough to rip you from the rock-face and send you airborne. Many strong climbers have been thwarted by the mental prison of fear. Conversely, moderately-strong climbers are often able to climb harder than those much stronger than them, simply because of their clearer head space. 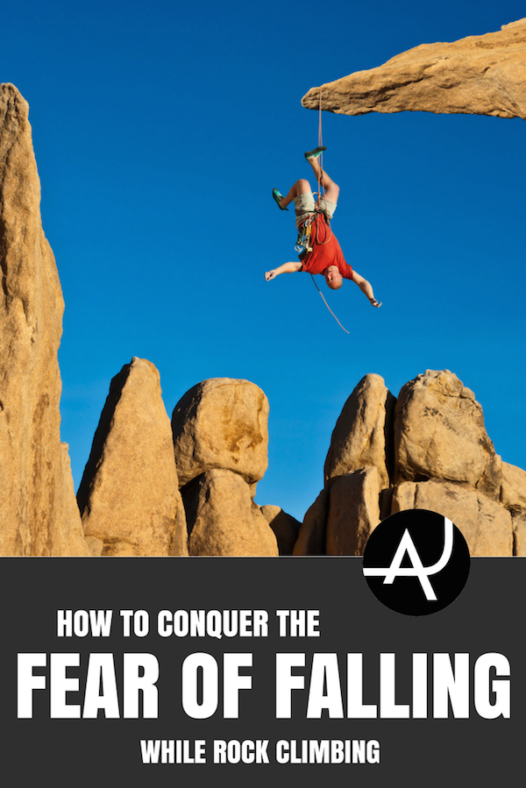 In this post, The Adventure Junkies will walk you through a number of ways to help conquer the fear of falling. When you’re scared, a part of your brain called the amygdala starts screaming at you. The amygdala is a finely-tuned evolutionary tool that activates in the face of an imminent threat. It’s what used to keep you alive if you were born millennia ago and roamed the African savannah among creatures that could eat you. When alerted, the amygdala kicks the central nervous system into action. Your blood pressure, heart rate and breathing increase, and you are flooded with adrenalin and cortisol. The blood flows to your extremities as your body readies itself to survive either by fighting, if you think you can overcome the threat, or fleeing, if you think you can’t. Often, however, there is a third response – freeze. This occurs if your have neither the strength to successfully fight, nor the ability to escape. This often happens in climbing: you’re pumped out of your mind, anxiously over-gripping, so you don’t think you can make the next move. You’re also terrified to let go and take the fall. So you just freeze. Because you are not using the extra energy that your body has produced to fight or flee, you may start shaking. The part of your brain that reasons and judges (the cerebral cortex) shuts down, impairing your ability to look around for holds or sequences you may have missed. You simply hang on, gripped in terror, until you can’t physically hang on any longer. 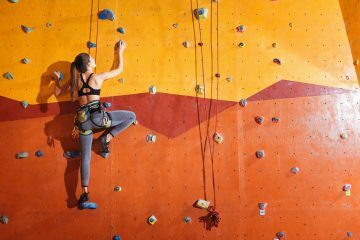 There are a number of books about sports psychology and climbing in particular that looks into how to improve your mental game, including increasing focus and awareness, and making intelligent decisions about risk. The original textbook on this is The Rock Warrior’s Way, though there are now countless books written along the same lines. Before you get on a climb, you can take a good look and judge how dangerous it might be. Are there any ledges that could make a fall potentially injurious? Is the lower protection easy to clip, or is there a risk of a ground-fall while trying to clip? Are there any traverses that could turn a fall into a pendulum? Are there any scary run-outs (where you have to climb way above your protection) and, if so, what is the climbing like in those sections? If there are risks, then you can steel yourself for those moments, and communicate to your belayer about where they are, so your belayer can be extra attentive and encouraging. If you are in a dangerous spot, always remember that down-climbing might be the best option. 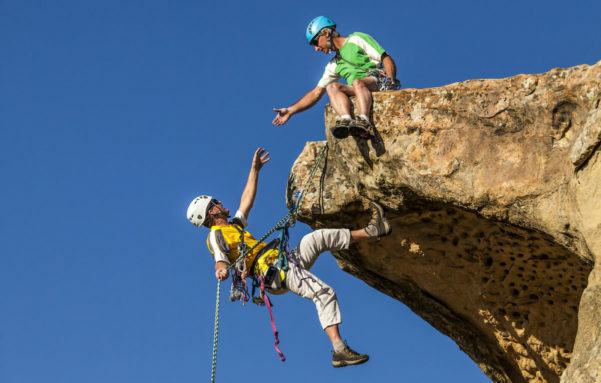 If the risks are relatively benign, then once you’re on the climb and feel gripped by fear, you can rationalize that the danger you are sensing is not actually real, and that falling will be relatively harmless. This may help you just go for the move, to fight, rather than to freeze or flee. Some falls can hurt, but many more are more or less harmless. If the idea of falling terrifies you, practice. If the fall in a particular spot on a particular climb terrifies you, go there and take that fall. Several times. The more familiar you are with the action, the less it will scare you. After you take the fall, breathe, reflect on whether it was actually dangerous and, if you are still worried, climb back up and do it again. 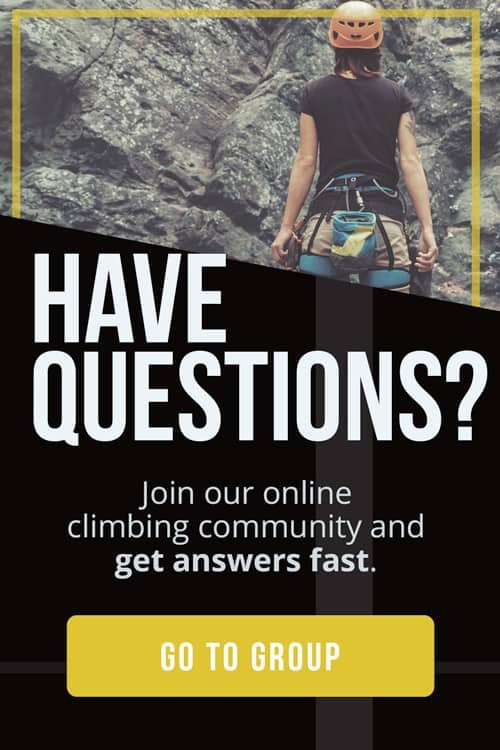 One method is the clip-drop technique, where you take a fall every time you clip a higher bolt on a sport climb. 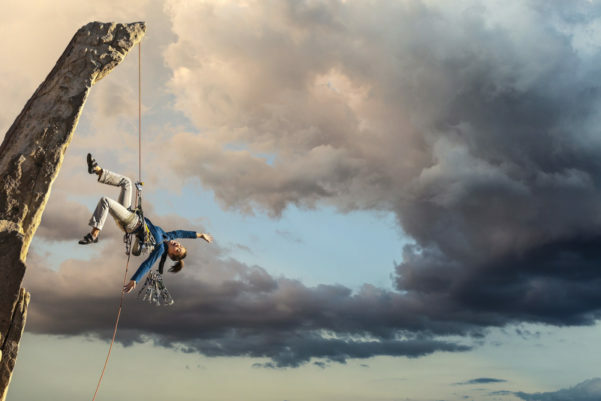 In the same vein as falling practice, the more you climb, the more familiar you will become with the various aspects of climbing that may scare you, whether it be a fear of heights, of overhangs or a roof, or traversing. A constant exposure to fearful situations is one of the ways that helped to explain the calmness of elite climber Alex Honnold’s amygdala – he had free-soloed so often that it didn’t phase him much anymore. If you’ve been on the climb before, or even if you haven’t, it helps to visualize the moves. That way, when you get to the hard section and have to try harder, you will be somewhat prepared for the mental and physical difficulties. Try to think about as many details as possible, from how the hold will feel on your hand, to how the sunlight might make you squint. Go through the moves and the body positions on the ground, before you start climbing. Slow, even breathing steadies and calms your heart rate and, as in meditation, aims to keep you present. This helps you stay focused and to concentrate, and not be pulled into that zone where you simply freeze and wither until you have no option but to simply let go. Either out loud or in your head, self-talk can calm you down if you are gripped with fear. For example, if you’re on a climb and know that the risks are minimal, then you can tell yourself that your fear is natural, but you have no reason to be scared, and that the fall is harmless. You can also tell yourself to stop negative talk such as “I’m gonna fall, I’m gonna fall”, and replace it with positive phrases such as “go for it”, “I am strong” or “I’ve got this”. Knowing your ability is also useful, so you can tell yourself that the climb is within your capability. When you are pumped and scared, remember that you are almost always stronger than you think you are in those moments, and you almost always have more left in the tank than you think.